A couple of months ago, while 10-year-old twins Isabel and Dillon Moran were enjoying an afternoon at Amazon Pool, Dillon noticed a man who seemed to be in trouble. "He said, 'I think I'm having a seizure,' and he fell," says Dillon, who won a commendation from the city for his quick action in summoning a lifeguard. 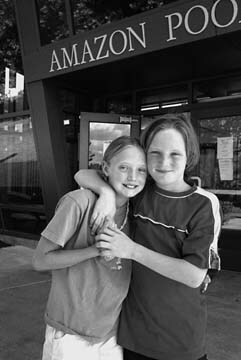 Soon to be fifth-graders at Harris, the Moran twins are Amazon Pool regulars who learned to swim in the YMCA's after-school program. "I'm on the swim team," says Isabel. "I swim because I'm training for basketball." The twins often do volunteer work at the Y, such as minding the front desk or reading to younger kids. They volunteer big-time when they accompany their father, Springfield special-ed teacher Tim Moran, and his students, on community-service projects. "We volunteer a lot at Grassroots Garden," says Isabel. "I picked the largest carrot two years in a row. It accidentaly got cut up in the stew." Dillon is leading a project, along with several special-needs young people, to adopt "Ki," an injured red-shouldered hawk, at the Cascades Raptor Center.